Of all the recently evolved techniques in astrology, the use of planetary midpoints has been one of the most thorny, complex, and unapproachable. Perhaps that is because its 1920s German originators (Ebertin, Wangemann, and others) wrote such dark, dense, and dire interpretations that it’s been hard to get past that stage. Yet, a significant percentage of astrologers use them creatively and positively as a tool for expanding the interpretation of a chart beyond its traditional elements. Astrologer and teacher Don McBroom has done a good job of making this sometimes-daunting method of interpretation at once simple, clear, and friendly. He paints midpoints between two planets as being areas where there is mutual planetary tension and any third planet placed there becomes a facilitator of the energies of the other two. It’s a simple and straightforward proposition and all else leads from there. It guides you through the dizzying array of midpoints and midpoint pictures most astrology chart programs provide so you can distill their meaning, see what’s relevant, and ignore the chaff. 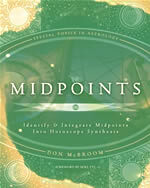 Midpoints are mercifully portrayed as a supplementary technique, instead of the fundamental focus (as in the German take), a refining layer to take into account especially when you haven’t any further information to go on or what you do have is inconclusive. That’s particularly the case with unaspected or peregrine planets, to which the author devotes an entire, very helpful chapter. Another useful section covers midpoints that focus near the Aries Point (0 Aries in pure midpoints, 0 cardinal signs if you use a 90-degree sort). There are lots of sorted examples of all the planets at various midpoints (not a totally exhaustive cookbook that covers every possible combo, but plenty enough to get the meanings of each planet across). And, an emphasis on and listings of relevant planetary keywords really help focus the effort. Also included are how to integrate midpoints with larger chart aspect patterns, how midpoints may be used in transits and progressions, and even how to use them as an aid in rectification. Not touched on, perhaps for a future volume, is the difference between far and near midpoints in strength or relevance or the basis for jumping to a 90-degree sort that makes the square of a midpoint have the same reality as a near or far one. Most astrologers do make some differentiation, with varying reasons, and here’s where some background theory as to why one would choose one against the other would come in handy. But in toto, Don McBroom has provided one of the most easily accessible approaches to midpoints — and achievement through which his reputation as a communicative and inspiring teacher of the art is happily confirmed.